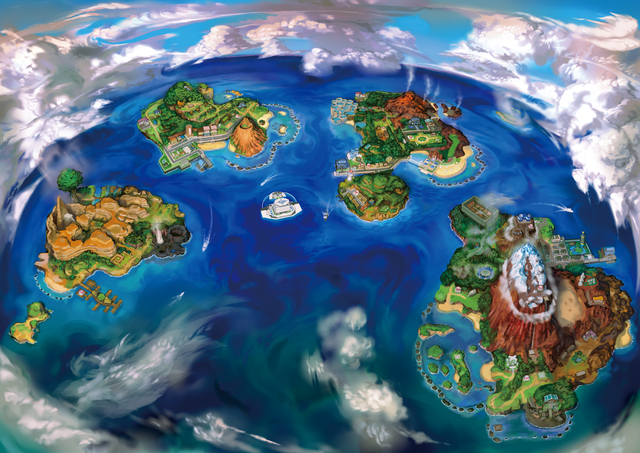 The region in Sun and Moon is called the Alola region and is based on Hawaii. 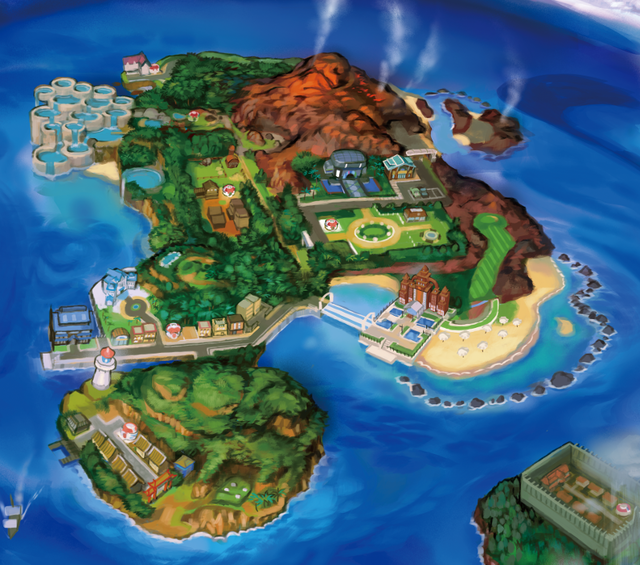 The Alola region centers around four islands rich in natural beauty, and an artificial island. It is a popular resort destination and attracts a lot of tourists from other regions. In Alola, humans and Pokémon coexist in a very close relationship, and a culture has developed that is different from other regions. Need directions? Check out our Map Tool! Melemele Island is the island where you and your mom have moved to, and where your adventure starts. 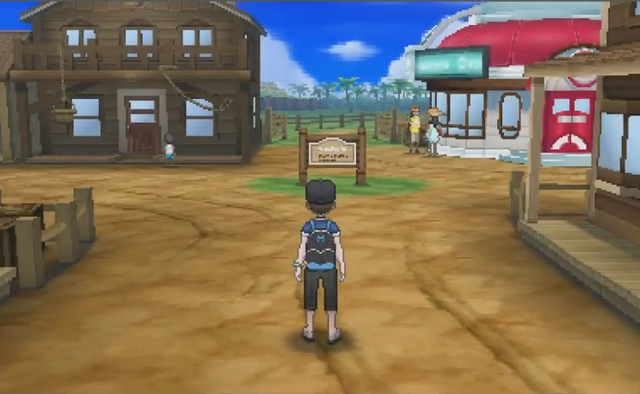 This is where you meet Professor Kukui, Hau, Lillie and others, and where you'll be given your starter Pokémon! 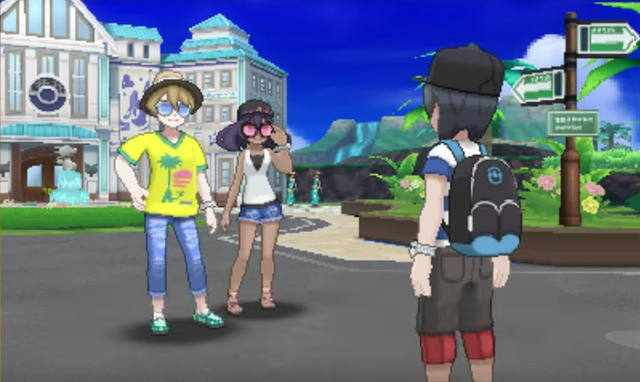 You live with your Mom in Hau’oli Outskirts, which is also the area where Professor Kukui’s Pokémon Research Lab and the Trainer's School can be found. Following Route 1, you end up in Iki Town, an old town where traditions have been passed on for generations. 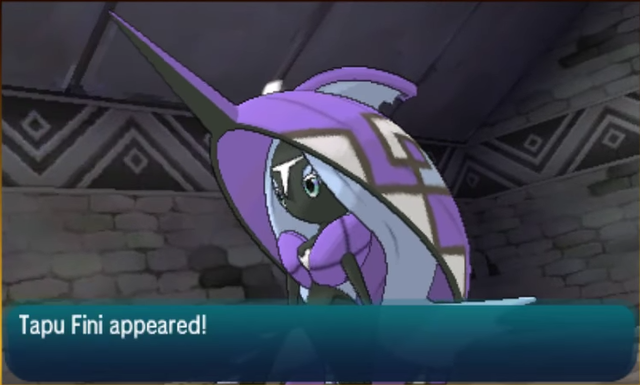 The villagers here are close with Tapu Koko, the guardian of the island, which resides in the Ruins of Conflict close to the town. 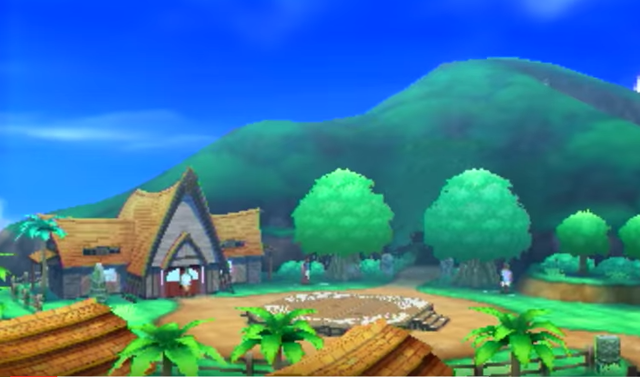 Iki Town is also where Hala lives, the Kahuna of the island, and where the island’s Grand Trial is held. 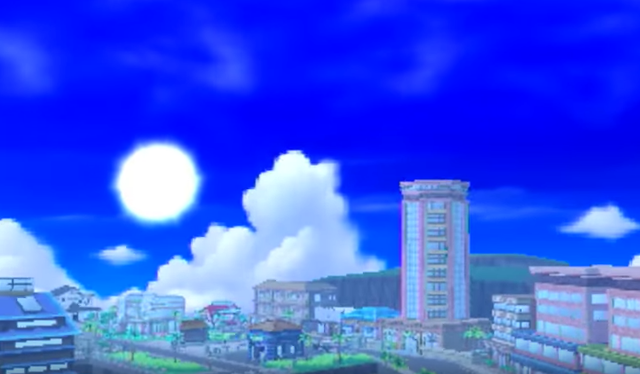 Past the Trainer's School is Hau’oli City, which is known as Alola’s largest city. It has a Beachfront, a Shopping District, and a Marina. 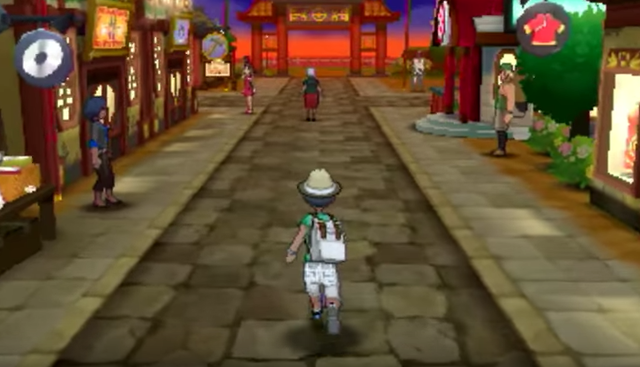 It is also the city in which Captain Ilima lives. 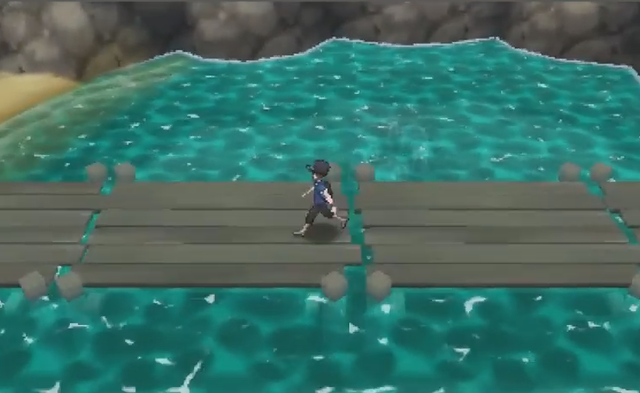 From Hau’oli City, Route 2 can be accessed, which is connected with the Hau’oli Cemetery and Verdant Cavern, in which your first Island Challenge Trial is held, by Captain Ilima. 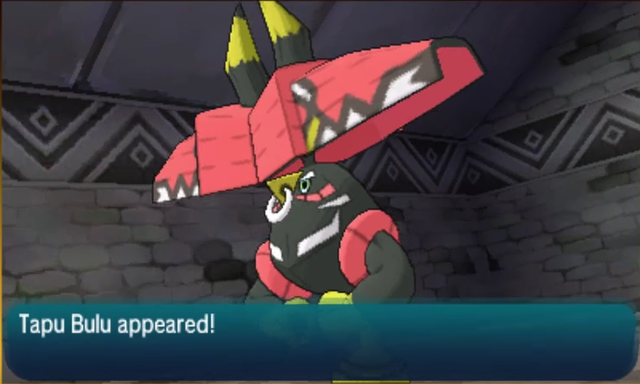 The Totem Pokémon of this Trial is Totem Gumshoos in Pokémon Sun, and Totem Raticate in Pokémon Moon. 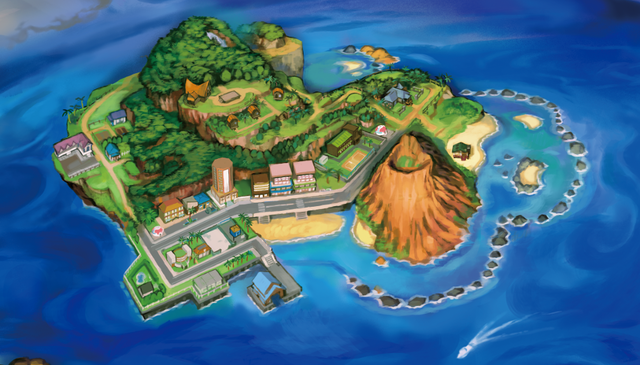 After completing Ilima’s Trial, you have access to Route 3, which connects to Melemele Meadow, Seaward Cave, and Kala’e Bay. In Melemele Meadow you can collect nectar which changes Oriocorio into its Pom-Pom Style. Akala Island is the second island you will travel to. You will only be allowed to travel here after first completing Melemele's Island Grand Trial and defeating the Kahuna there. Heahea City is considered the 'front door' to Akala Island, as it is the first town you arrive in after traveling to the island by ferry. The Name Rater can be found here, in the Akala Tourist Bureau. At the Tide Song Hotel, you meet Dexio and Sina, who will give you the Zygarde Cube there. Furthermore, there’s the Dimensional Research Lab, where Professor Burnet researches Ultra Wormholes and Ultra Beasts. 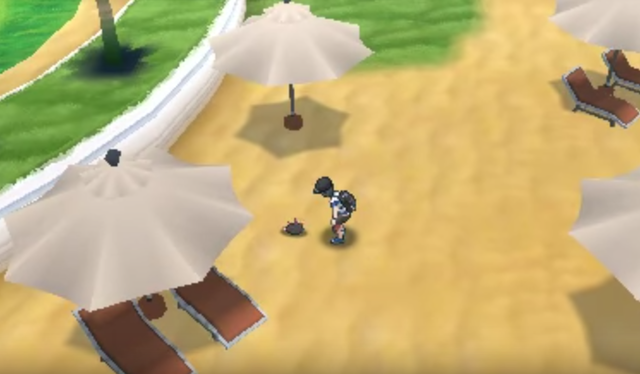 Finally, Game Freak’s office can be found in this town, and the entrance to Diglett’s Tunnel, which is only accessible after completing all the Island Trials on Akala Island. From Heahea City, Route 4 will lead you to Paniola Town, a town located in the middle of the island and surrounded by ranch land and pastures for grazing. This is where Captain Kiawe lives. Next to the town is Paniola Ranch, where the Pokémon Nursery can be found. North from the ranch is Route 5, which connects to Brooklet Hill. 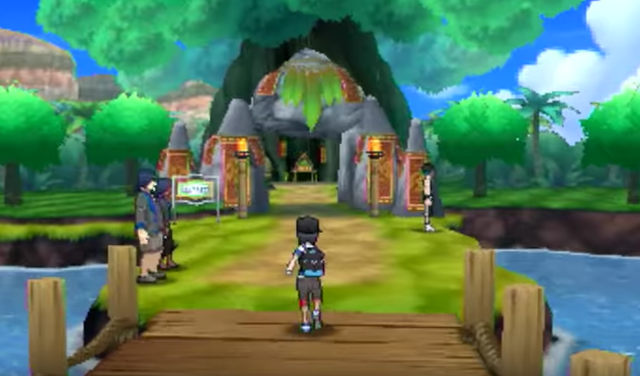 This is where you first Trial on Akala Island is held: Captain Lana’s Trial. The Totem Pokémon you have to defeat in this Trial is Totem Wishiwashi. 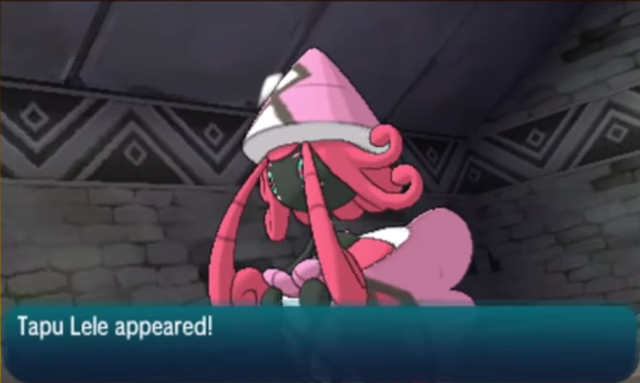 After completing Lana’s Trial, you’ll have access to Route 6 and Royal Avenue, where you can gather nectar to change Oricorio into its Pa'u Style, and where the Battle Royal Dome can be found. There’s also the Thrifty Megamart here, where you can buy items for a discount. From Royal Avenue, you can travel Route 7 which leads to Wela Volcano Park. 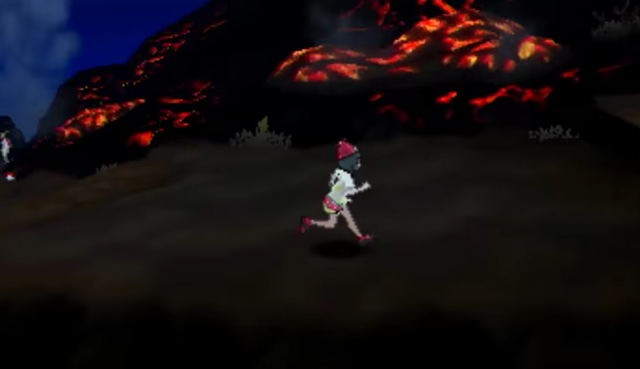 On top of the park is a Trial site where Captain Kiawe’s Trial with Totem Salazzle is held. After completing Kiawe’s Trial, you gain access to Route 8, home to the Fossil Restoration Center where you can restore fossils. The route connects to the northern part of Route 5, where Lush Jungle can be found. 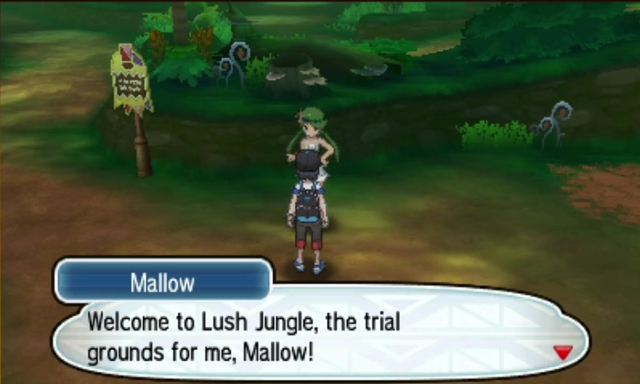 Captain Mallow has her Trial here, in which you have to defeat Totem Lurantis. 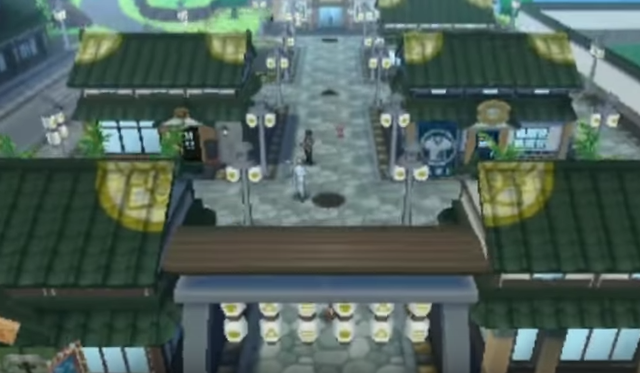 When all Trials are completed, you can travel through Diglett’s Tunnel in Heahea City, which connects to Konikoni City, a city of merchants. The Friendship Rater is among these merchants, and Kahuna Olivia has a jewelry shop here. 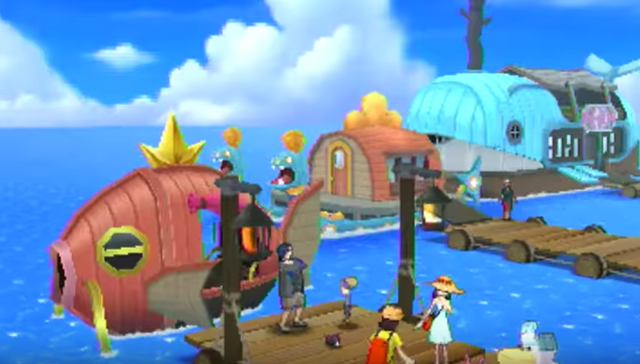 Captain Mallow lives in the restaurant, which is owned by her family, and Captain Lana lives in the town with her family, too. Next to Konikoni City is Memorial Hill and Akala Outskirts, past which you can find the Ruins of Life. 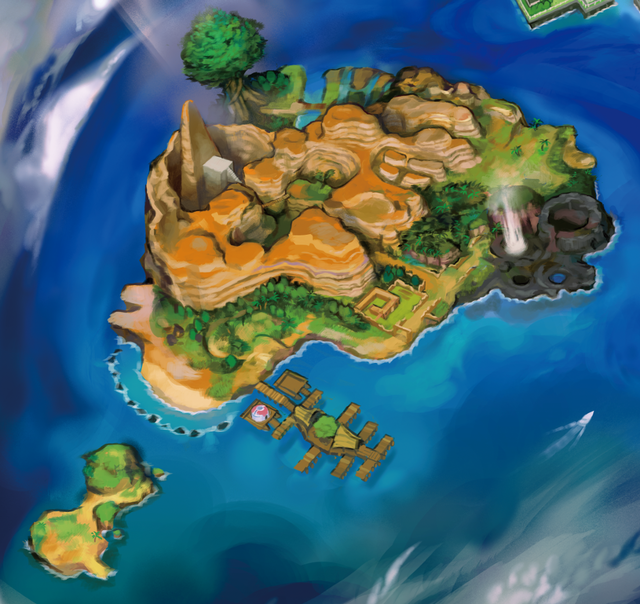 This is where Tapu Lele, the island’s guardian, resides, and where Kahuna Olivia’s Grand Trial is held. After defeating Kahuna Olivia, you can visit the Hano Grand Resort, the biggest of all the resorts in the Alola region. 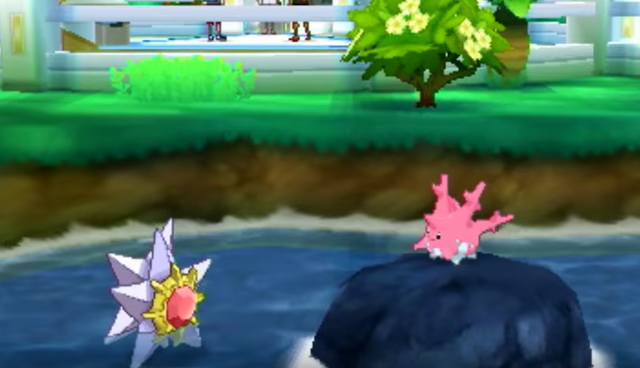 Next to it is Hano Beach, where Pyukumuku-chucking is a popular part-time job to do. When arriving by ferry, Malie City is the first town you visit, a city with an obvious Eastern influence in its design. It has shops, a garden, a library, and a community center. At the Outer Cape north of the town, there is a Recycling Plant, which is co-managed by people and Pokémon. A man named Gester can also be found here, who teaches you battle styles. Finally, Malie City is where you battle Kahuna Nanu in his Grand Trial, after you have completed all the Trials on Ula’ula Island. From Route 10, you can take a bus to Mount Hokulani, a mountain suitable for observing the stars, which is why there’s an observatory on top. 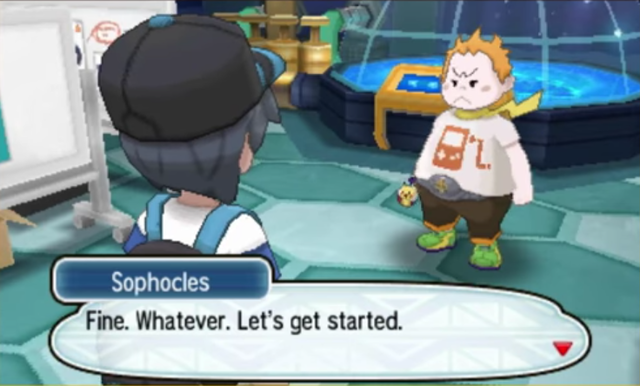 The Hokulani Observatory is where Captain Sophocles has his Trial with Totem Vikavolt. From Malie City, Route 11, Route 12 and Route 13 can be accessed, on which you find a Geothermal Power Plant, and Haina Desert, in which the Ruins of Abundance are located. This is where Tapu Bulu, the island’s guardian deity, resides. Route 13 leads to Tapu Village, the remains of a village said to have been destroyed by the island’s Tapu when the people roused its anger. 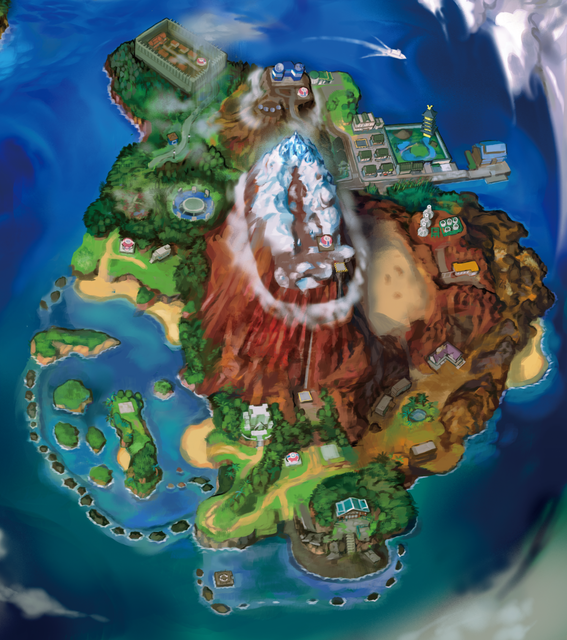 North if the village is Mount Lanakila, where the Pokémon League is located on its summit. It can only be accessed after completing the Island Challenge. South of Tapu Village, an abandoned Thrifty Megamart (also destroyed by Tapu Bulu) can be found. 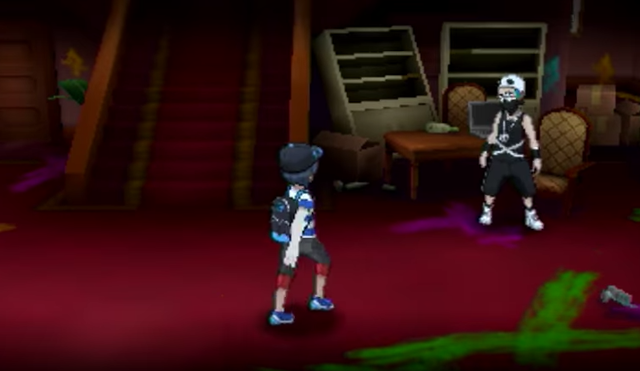 This is the site of Captain Acerola’s Trial, in which you battle Totem Mimikyu. After Route 14 and Route 15 is the Aether House, which if often visited by Captain Acerola to play with the children and Pokémon there. By surfing on the water west of Route 15, you can access Route 16, which leads to Ula’ula Meadow. A place where red flowers bloom in abundance and where nectar can be gathered to change Oricorio into its Baile Style. East of the Meadow is the Lake of the Moone (Pokémon Sun) or the Lake of the Sunne (Pokémon Moon). Both places seem to have some connection to the Alola’s Legendary Pokémon. 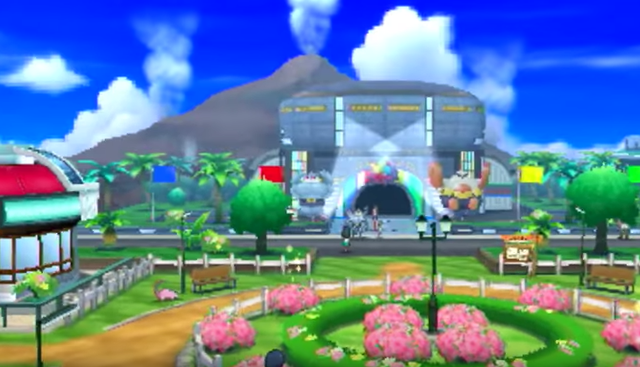 Past Ula’ula Meadow is Route 17, which houses a Police Station in which Kahuna Nanu (also a police officer) lives with his Alolan Meowth. 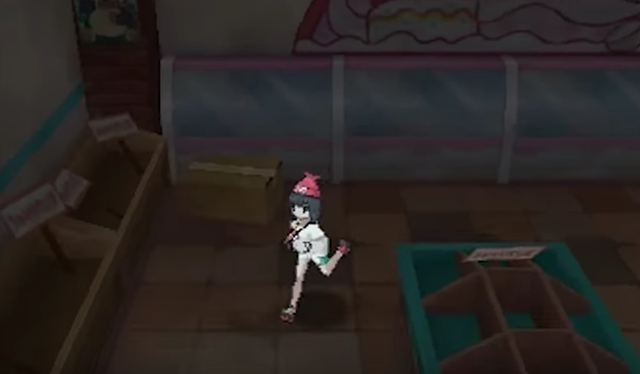 The route leads to Po Town, a town occupied by Team Skull. Seafolk Village is the first area you enter when you arrive on Poni Island. It is a village of a wandering people who live on ships. From here you can take a ferry to Exeguttor Island, a small, uninhabited island where many Exeggcute and Alolan Exeguttor live. From Seafolk Village, you can enter Poni Wilds, which connects to the Ancient Poni Path. This path leads to Vast Poni Canyon and has Kahuna Hapu’s house located on it. 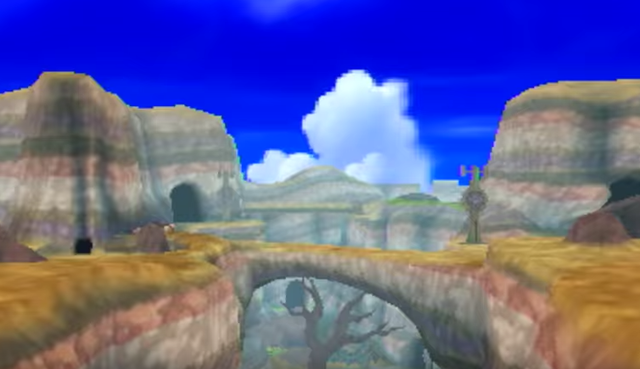 Vast Poni Canyon is the location of Kahuna Hapu's Grand Trial, and also has a natural Trial site, where you battle Totem Kommo-o. 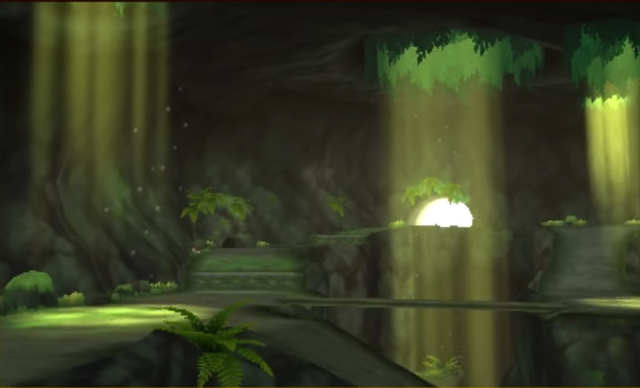 At the far end of Vast Poni Canyon, the Altar of the Sunne (Pokémon Sun) or the Altar of the Moone (Pokémon Moon) is located. These altars are said to be closely associated with the Legendary Pokémon depicted in the local folklore. Ancient Poni Path also connects to Poni Beaker Coast, which leads to the Ruins of Hope. In these ruins Tapu Fini, the guardian deity of Poni Island, resides. More locations on Poni Island become available after becoming the Champion, like Poni Meadow, where you can find Purple Nectar to change Oricorio into its Sensu Style. 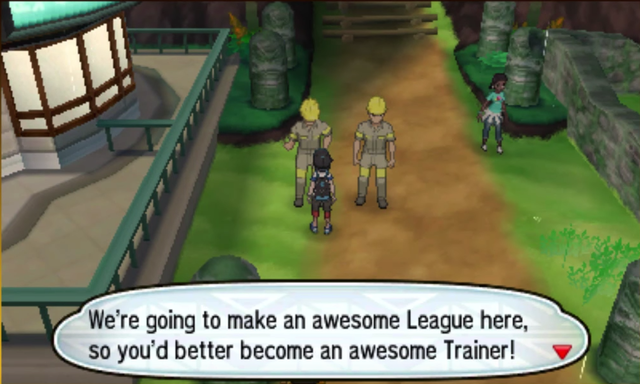 Furthermore, you’ll be able to access the Battle Tree, the sacred battle grounds for the toughest Trainers of the Alola Region. 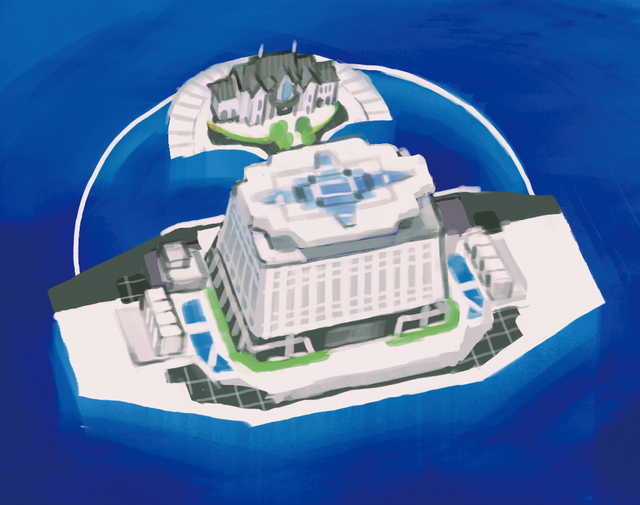 Aether Paradise is a very large floating structure that serves as an artificial island located in the middle of the Alola region, near Akala Island. It was created by the Aether Foundation to provide shelter for Pokémon, and to serve as a base for their research. To protect the wild Pokémon being treated in their base, a jamming signal prevents the use of empty Poké Balls within the facility. The building on the island has several floors. The Foundation's research labs can be found on the lowest floor. The docks are one floor higher, and above that is the entrance, where you can access a PC. The top floor is the conservation area, a garden in which the Pokémon that are being protected by the Aether Foundation live. At the end of Aether Paradise is a big mansion where the president of the Foundation, Lusamine, lives.